Happy day 2 of Independent Booksellers Week! Today’s blog comes from George Hanratty, manager of the magical, award-winning Tales on Moon Lane children’s bookshop in Herne Hill, south-east London. Here she reveals a guilty pleasure of Independent booksellers – working out what book suits which type of customer – as she reads THE CLOUD HUNTERS by Alex Shearer. THE CLOUD HUNTERS was sent to me with the very first set of Hot Key proofs over a year ago; I thought it sounded great but amidst a growing pile of ‘must-read’ proofs, it ended up languishing in my to be read pile. Out this week in paperback, it seemed like the perfect excuse to move it right to the top of said pile! Christien lives on Sovereign, one of an unknown series of islands floating in the sky spread over thousands of miles – the remnants of a long ago destroyed planet earth. The skies all around are filled with Sky Fish, trader ships and Cloud Hunter boats – traveling wherever they can to find clouds to convert into water – this world’s most valuable resource. 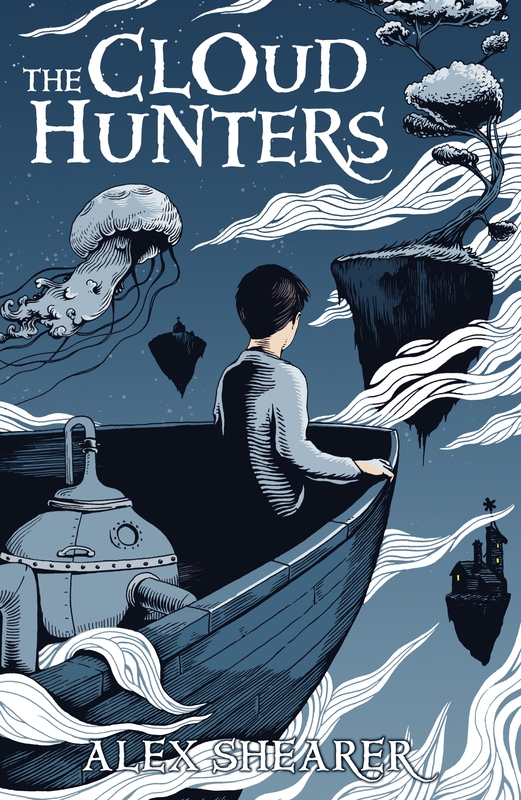 Christien is fascinated by the Cloud Hunters, a fascination which only grows with the arrival of Jennie at his school – beautiful, mysterious and bearing the ritual scars particular to Cloud Hunters. Enthralled with Jenine and her family, he longs to join them on their adventures and finally gets his wish to travel with them, encountering an adventure the likes of which he never expected. At its heart, THE CLOUD HUNTERS is a classic fantasy adventure but is given depth by the fantasy world Alex Shearer has created – a world spread across the disparate islands with all the complexities of our own: religious intolerance, warring nations, environmental issues and prejudice in all its forms. THE CLOUD HUNTERS is a novel that is perfect for hand selling. It is ripe for discussion and so I will be recommending it endlessly to teachers and librarians. But then comes the favourite part of my job, and the part that I suspect all Independent Booksellers love, reading a book and figuring out which of my regular customers it will be perfect for: those with a fantasy and/or sci-fi interest are obvious choices, but then there are those who love books with a strong female heroine, or the avid readers who always want something a little different. I’m also adding the members of my children’s book group (see our events page) to this list, as THE CLOUD HUNTERS is being added straight to the pile as the next book we will be discussing. This entry was posted in Our books, People We Like. Bookmark the permalink.